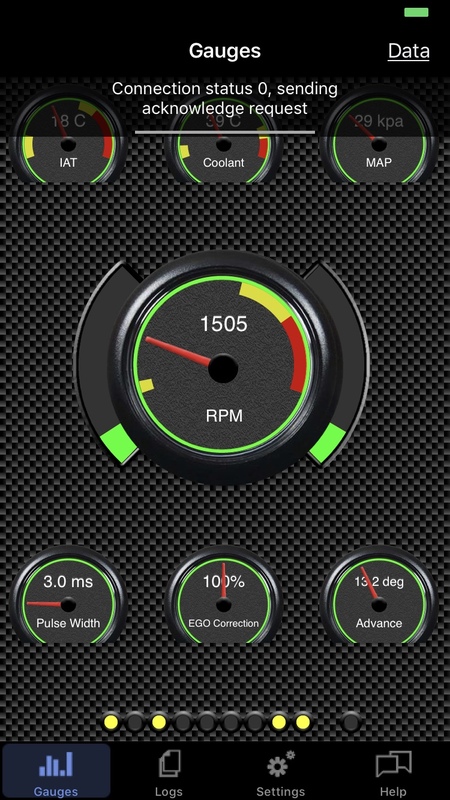 MobiSquirt is an iPhone and iPad app that allows you to connect to a MegaSquirt ECU, view realtime data from your car’s engine and log that data for later analysis using tools such as MegaLogView. It is expected that MobiSquirt will support all current versions of the MegaSquirt firmware but initial versions of the app will concentrate on compatibility with MegaSquirt 1, MegaSquirt 1 – Extra, MegaSquirt 2 and MegaSquirt 2-Extra. It is also anticipated that support for MegaJolt will be added. There is a very rough roadmap for the development of the app resulting in 3 major releases. V1.x will provide realtime views of the ECU data with a gauge/dashboard view and a raw values view. It will allow logging of the data in a standard .xls file. Log files can be transferred from the iPhone to your home PC using iTunes or, where your device supports it, via email. Display conversions such as the standard matfactor, kpafactor, thermfactor files can be loaded into the iPhone using the file sharing mechanism in iTunes. You will also be able to “replay” log files, again displaying the data using gauges or raw data just as you can on the realtime data. This version contains support for MS1-Extra and partial support for MS1. It contains all the anticipated features of the v1.x roadmap with the ability to view and log data, replay logs and transfer them via iTunes or email. 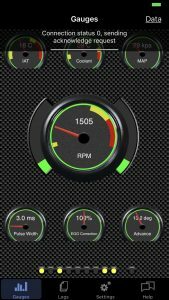 Version 1.1 of the app included support for MS2-Extra and an updated and improved gauge look and feel among other features. This version also includes native iPad support. A combination of factors, including the apparent meltdown of the MegaSquirt world, MicroChip dropping support for the WiFi connector, problems trying to balance the needs of older devices with the new etc… The app development took a long break and was removed from the App Store by Apple. Version 1.2 marks the return of the project with Bluetooth support, split screen for iPad and a completely new architecture that should see many more options for displaying and sharing log files going forward. V2.x will add realtime tuning options, allowing the user to view and edit ignition and fuelling tables in real time and burn the changed values to the MegaSquirt ECU. A small number of ECU settings will also be configurable, such as the Required Fuel Setting. V3.x will add the ability to change a much broader range of settings. iPad support was added in v1.1 and enhanced in v1.2 with the support of split screen views on iPad. There is still some work to do to tidy up the dashboard/gauges view but the latest architecture changes will make that a practical option. Any chance of getting the a 3D map display? I am thinking of using 3d mapping as the default method for changing the fuelling and ignition advance maps. It gives the easiest view of the data to understand and I can use gesture recognition to allow the map view to be enlarged/reduced using a pinch gesture and use slide gestures to change the values. That will be a major part of the work going into v2.x of the app. are you going to the Kit Car Show Kenilworth ? By the way, http://www.trigger-wheels.com has a stand there. I have a competition that weekend so won’t be able to make it unfortunately. Nice work so far! I can’t wait to see the final result. I have been considering purchasing a Megasquirt unit or possibly a DIYPNP unit for my old pickup, and this is yet another pebble on the “buy” side of the scale in my decision-making process. My opinion – MS retailers should be ringing your phone off the hook for help in marketing their product. IOS compatability is a big asset for a product and you’re the ones making that happen for MS. Thanks and Kudos!! MS3 support is highly likely, I had a look at it a while back and, from memory, I’m pretty sure I thought then that the MS2-Extra format would also support MS3. Can’t do anything on timescales at the moment though – too many paying jobs at the moment mean time on this is getting squeezed. Quite some time has passed since the last post on here. I’m sure quite a bit of progress has been made. The initial look of the app is very nice. How much closer to real time tuning have you gotten?